I've been craving something with a deep, yet subtle and resonating flavor that immediately warms your throat and lungs as it weaves its way down through your body. I can almost taste it, but the knowledge of what it is, is just narrowly out of my grasp. 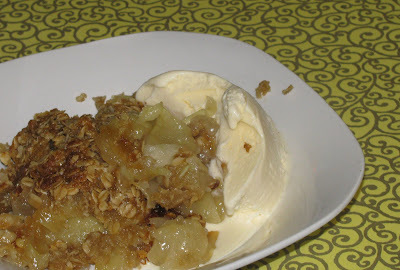 I thought it was apple crisp, but I shortly realized it was something much more intricate, with intertwining flavors of roasted pecans, toasted coconut, a hint of orange maybe, brown sugar - and then of course that missing piece which is alluding me. 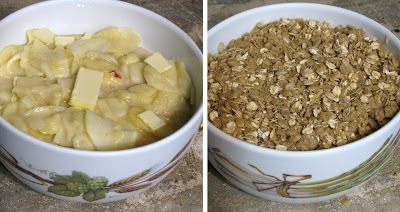 Apple Crisp is so simple, and so much like pie, but without the inconvenience of pie crust. that looks DIVINE! WOW WOW WOW YUMMMMY DUMMMY DOO! (don't know what that is about!) it looks great! you always have such cute fabric on your table when you take a picture. looks yummy! ooh, can I have some of that right now please? Oh my. That sounds really, really good. Bookmarking for sure.